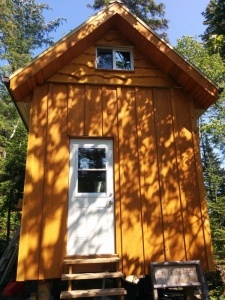 Our completed office, with all of the exterior siding produced from a local White Pine. Working from a tree, to lumber, to finished product is an an incredibly rewarding and satisfying project. Creating materials that are so central to our way of life, and from that crafting essential shelter gives an undeniable pride of self-sufficiency and sense of fulfillment. Chainsaw milling is without a doubt the simplest, fastest and least expensive way for the individual sawyer to create their own lumber. While it may not be the most efficient means for larger-scale operations, it holds a number of advantages for small-scale and DIY operators. Inexpensive: The most expensive piece of equipment required is the saw, something most people with access to a woodlot already own. If a suitable saw is already owned, then $500 can get one started in making their own lumber. Ecological: On-site milling eliminates the transportation costs associated with conventional lumber production. The portable setup allows a single operator to walk into the woods; fell and mill a single tree and walk out carrying lumber with virtually no damage done to the surrounding forest. Selective logging at its very finest and no road-building required! Simple: The tools used are familiar and simple and the process is easy to understand. The log can be milled where it lays so the difficulty and danger in moving heavy lumber is minimized. Extremely Portable: The entire kit can be carried in a canoe, or on a back. No heavy machinery or roads are required. This allows a single operator to mill trees that would be inaccessible to conventional methods or too difficult or expensive to transport to a mill site. Fun! Chainsaw milling is fun and rewarding. Turning raw logs into a finished product is an incredible process. It can also be a creative endeavour as unusual trees can be selected to create unique and specialty cuts. The options are limited only by your imagination! Register for a workshop today!